We’re still in the early midst of Oklahoma’s severe weather season, and TV meteorologists are already hard at work making sure they get credit for catching the first tornado of the season. Oklahoma records its 1st tornado of the year per @KOCONickSmith & @KOCOjonathan .Last year Oklahoma did not record its 1st tornado until early May. That’s nice. Spotting the first tornado of severe weather season is a bit like scoring the first touchdown of football season – it’s inconsequential and doesn’t really matter in the whole scheme of things, but it’s cool nonetheless. At the very least, it’s a fun thing to experience. It also gives the Channel 5 promotions department something to mention for those 15-second weather promo spots they air during May sweeps. Still no OK tornadoes for April, 2019 logged at STORM prediction center. Yikes. Damon Lane is being tag-teamed by Gary England and Mike Morgan. I think that’s both the nightmare and fantasy of every young meteorologist in the Metro. I hope Damon enjoys it. So if I were @ounwcm, I would ask for a short video clip. NW of Jones video clip on 3.23.19 was “inconclusive” despite condensate inside of spinning spray bands, lofted debris, much stronger meso. and SVR Supercell. Oh, so that explains it. Back in March, I guess Mike Morgan was the first weatherman to cry tornado, only to have it struck down by the NWS like a weather balloon in a hail storm. Mike, being the paranoid weather-obsessed man he is, obviously can’t allow another weatherman to bask in the first tornado glory without proving it. What the hell?! I’m with Mike Morgan on this one. I see clouds moving and swirling and stuff thanks to the sped-up video, but that little whimper is a far cry from the mega-rotating multi-vortex grinder wedge debarkers we see on TV churning through the state each May. I think the Tasmanian Devil generates bigger funnel clouds than that! You probably won't get a "confirmed tornado" report from this. Many brief spinups rarely make it into an LSR unless damage is noted. All you can do is say,"Well,SPC did have a tornado risk in there.."
I, admittedly, do not have a degree in meteorology, but if it’s not a “confirmed tornado,” doesn’t that mean it’s just not a tornado. That’s how things work, right? Damon never fully fessed up to his error, but by Monday morning, his wingman Jonathan Condor put out this one minute recap of the video. He admits that it’s probably not a tornado, but that it doesn’t matter anyway because it didn’t cause damage because it wasn’t a tornado. Make sense? Anyway, I was going to close this thing out with a reader poll for us to guess on what date we’ll see Oklahoma’s first “confirmed” tornado, but Mike Morgan beat me to the punch. Kind of. So! How many tornadoes have occurred in Oklahoma in 2019 to date? April 7, 2019. Is he referring to “confirmed” or “unconfirmed” tornadoes? I’m as confused as a KOCO stormchaser filming a cloud. This is beautiful! Not as beautiful as the “ring” lit up a night, but nice. I’m going to go ask my 1990’s Okie chase buddy for his take on all this…..I’ll be back. What about the tornado that hit Trump’s “biggest and greatest inauguration crowd of all time”? Facts just don’t matter anymore. This answers the age old question, “If a tornado touchs down in the forest and no one is there to confirm it, will a TV chase crew run someone off the road to be the first to get a video of it?” with a resounding, “YES, duh!”. Actually, the first tornado in OK this year happened in the parking lot of Ted’s in Norman on January 15, as I was heading to my car after eating several roasted jalepenos. Unfortunately I didn’t get a video of it. Seriously, just hit the parking lot then moved 0n? Oklahoma weather go figure. wonder what Ja Rule’s thoughts on this are. This brings me so much joy. Even David Payne has weighed in on Twitter. Brings joy to this Okie’s heart. Obligatory “Gary England is a horrible tipper” post. Please note it is only the weather guys playing the “I’m first” game to drive ratings. Conversely the weather ladies/babes/gals/girls/trophies/stars/whatever just report what THEY see and we drive their ratings by what WE see. David Payne found a weather dong in his pocket. 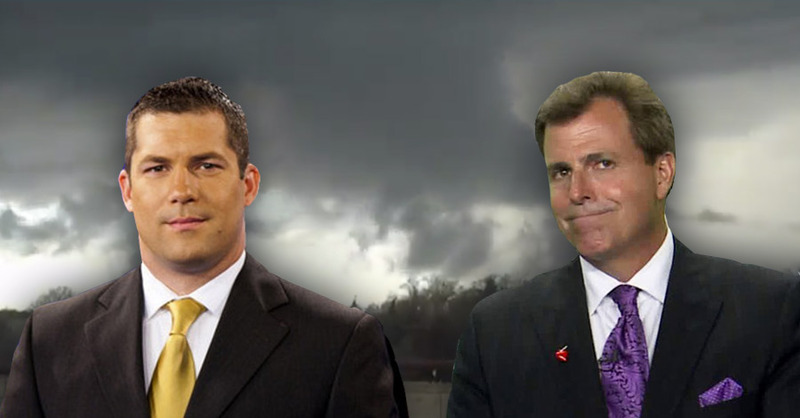 Its the battle of a guy who graduated from NC with degree in meteorology and a guy who flunked out of OU meteorology. I don’t get whats the fascination with Morgan and his high riding pants and the news director at KFOR. To say Morgan “flunked out” isn’t accurate. My grandfather always told me “never trust a man who doesn’t use his real name”. That’s partially why I care to not watch Mr. Smuzynski’s forecasts. I love the irony here….posted by someone who doesn’t use his real name. Killed any ghosts lately Dr. Venkman?